Audio provides the emotion in a movie. Multi-tracking now allows what used to be professional studio sound to be created with a laptop. We start our exploration of this potential by creating a ‘character’ voice – in this case a dinosaur. To bring such a creature convincincly ‘to life’ will take many of the digital resources available. The suspense in most movies is created by the sound track. Essential: Windows Sound Recorder; Audacity or equivalent…………..
Sound clips for practise: growling, background noise, jungle etc. Desirable: freeware audio mixing and editing software; Audacity and Kristal Audio from Kreatives.org. Windows Sound Recorder is limited to 60 second recordings. If you need a longer track, open an existing longer .wav file and save it with a new name. Record over it. Audacity will record length automatically. Save the tracks in a high-quality format –ie- ‘save as’ 48,000 hz mono. Make sure to give it a meaningful name such as ‘dinosaurgrowl.wav’ or ‘junglesounds.wav’. After all editing is done with sounds, these can be compressed to a smaller file size such as MP3 if you want to play this on the Web. Audio files can be opened, saved, cut & pasted like any other file. To shorten a file use the slider control to go to the point you want to be the starting point and select ‘Edit > Delete Before Current Position’. Use the slider control to go to the point you want to be the end point and select ‘Edit > Delete After Current Position’. With Audacity use the ‘View > Zoom to Selection’ and ‘Fit in Window’ commands then ‘Edit > Select > Start to Cursor’ and ‘Cursor to End’ to select the areas. ‘Cut’ will allow you to move a clip and ‘delete’ will remove it. Distance in audio is noted by the way the sound reaches the two ears. There are delays in reaching the ears due to the speed of sound being slower than light. Big distant sounds produce a lot of echoes. We can create this effect with ‘reverb’ in software. In Sound Recorder, this is done with ‘Effects > Add Echo’. Voice in audio can be made to sound bigger or older by lowering the pitch. Large animals have larger voice boxes. It is like comparing a violin and a bass fiddle – the larger the voice box the lower the sound. So speak or growl with a lower tone. There are many other special effects available. For example, most video cameras record in stereo. This means that the closer the animal moves toward you, the more the two ears hear separate sounds. A dinosaur could be made to sound like it is getting closer by increasing the stereo separation when it is supposed to be close. This is an advanced technique but it could be done with Sound Recorder or Audacity merely by using ‘pan’ controls or recording the far away part in mono and the close part in stereo, then adding the mono track to the beginning of the stereo one and saving the result as a stereo track. A human growling into the microphone can be made to sound like a dinosaur by lowering pitch. In Sound Recorder, this can only be done with ‘Effects > Decrease Speed’, which also slows the sound. This means you would have to record the sound by growling faster so that when it is slowed down it is at the correct speed. Audacity allows ‘Effect > Change Pitch without Changing Temp’, which means you can record at your natural speed. If some of these are stereo files the number of tracks quickly blows out to 6 to 8 tracks that have to be combined. This is called “mixing”. A dinosaur movie would have growls and chomping as ‘character sounds’ with insect and bird noises as ‘backgrounds’. There might even be a musical track to build suspense. These would then be combined and ‘reverb’ applied to make them all seem like they occupied the same space. To do this requires ‘multi-tracking’ –ie- playing more than one track at the same time to record on a third track. It is possible to record microphone while listening to and recording a backing track and thereby record a song or voice-over. You can also combine sounds you’ve already recorded. This means that by playing two different Sound Recorder windows at the same time, their combined sounds can be recorded in a third Sound Recorder window. This procedure would be inadequate for making music because the time delay in pushing the start buttons would put the tracks slightly out of synchronisation. But a dinosaur voice does not have to be synchronised to a background track. Just open one window of Sound Recorder with backing.wav. Open a second Sound Recorder with the dinosaurvoice.wav. Open a third and hit ‘record’. Go back to the backing.wav and hit ‘play’. Go to ‘dinosaurvoice.wav’ and hit ‘play’. Go back to the recording window and when the sound track has played through save this as ‘dinosaursoundtrack.wav’. Rewind the track and listen. If either the dinosaur voice or backing is too loud or soft go to the ‘edit – audio properties’ menu and adjust the sound recording and playback volumes until you get the right mix. Tip – record only a few seconds of this while doing adjustments, rather than the entire track, until you get it right. It is much easier to do sound mixing with specialized multitrack software such as Audacity and Kristal Audio. It is important to know, however, that the same effects can be obtained using Windows Sound Recorder. Most animations are silent. Sound effects have to be created for them. Live action such as puppets and miniatures creates a sound track in the camera but this will not usually be suitable for the movie –ie- it may have noise from movement, the internal noise of the camera and passing traffic. The voices of the persons doing the filming and the scraping of plastic toys on a desktop will not sound anything like 5 tonne dinosaurs. However, that camera sound track may be useful as it is a synchronised recording of what happened during filming –ie- the actions of puppets are captured as movement sounds. These sounds can be amplified then pitch-shifted or vocoded to resemble dinosaur sounds. They will become a deep rumbling sound that is perfectly synchronised to the actual movements of the puppet. An artificial method of doing this is to use a ‘contact microphone’ or noise maker to deliberately capture a sound track. The puppeteer mounts the contact mic somewhere on the puppet or holds it in the other hand while manipulating the puppet. Every time the puppet is moved this creates a sound -even just tapping on the table will do. This takes a little practise. It is a very effective technique similar to that used in 1940s radio dramas. These sound effects can then be edited in software to add echo and change their timing and pitch. To an animator, this means that the control points for facial ‘mesh morphing’ have to be stretched around to fit the dinosaur. This used to be an advanced feature but recent software releases have made non-human faces a standard option for CrazyTalk. Walking and other movements can also be done in software. The easiest method is to buy ready-made software 3D models of dinosaurs. Slowed-down human movement might be substituted. It is possible to film your own sequence with stop motion, claymation, and other techniques. But these take time. Without a template, it is usually quicker and more realistic to film a hand puppet than to try and create a digital dinosaur. Windows PCs and Macs both have built-in sets of voices. The Microsoft set is referred to as the SAPI set and is available through Control Panel > Speech. Additional voices can be purchased and installed. TextAloud and Textease are programmes designed for interactive whiteboards with a variety of high quality voices and can read in different languages. A stand-alone version of the software can cost over $100 and each voice an additional $45. Voices are an essential element of any serious school animation studio. CrazyTalk includes a text to speech facility based on the Microsoft set and will play any other installed voices. The voices are licensed for personal use only, so not intended for web publication. 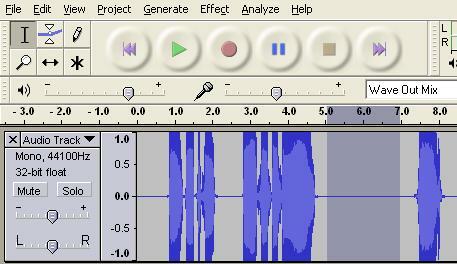 Text to speech is played and recorded like any other audio file using Sound Recorder or Audacity. These sound editing programmes are essential to make the speech more realistic by inserting pauses. They can also pitch shift and echo the voices to provide special effects. A crowd scene could easily be created by multitracking a few such scripts. Text is easy to edit and manipulate. The main disadvantage to the Mac voices is export. Either separate software needs to be obtained to encode to .wav or use ‘line output’ or ‘headphone’ from the Mac to connect to a ‘line input’ (NOT mic input’!) on a PC. There is also software available to record internally to a Quicktime or other Mac format. A Mac is a versatile, worthwhile addition to any school movie studio. ‘vocoding’ – a process whereby one sound is driven by the timing of another. There are a number of freeware vocoding software programmes available. Sample looping – using a midi file to trigger sample loops. There is some freeware available and countless sound samples. Garage Band in Mac works on this principle. These can be used to make movie soundtracks. However you use these, it will eventually be necessary to keep a catalogue of sounds with meaningful names –ie- ‘frog_croaking.wav’ instead of ‘30046.wav’. This is most usefully done on a spreadsheet. ‘Post-production’ is the term for putting the audio and visual components together to make a movie. There are plenty of software packages available to create and edit movies. Versions of professional movie studio software are now available to use with standard desktop computers. There are dozens to choose from and they are often sold at dramatically-reduced educational prices. The ones readily available in the school system, however, are Windows Movie Maker, Adobe Premiere and Mac iMovie. These are available as part of the software that is licensed with the computer. The more sophisticated programmes follow the same general principles but are generally more complex to learn. The first method has the key advantage that timing is done within each track so you don’t have to keep editing the sound to fit the video. You can cut, paste, and move these clips without affecting the movie. The disadvantage is that sometimes the software will throw these clips out of synch. Also a background music track may span more than one clip, meaning it will be easier to combine this later. Some transition effects such as exploding and disappearing, blue screen, and rain/fog effects have to be done within a clip then saved before combining into a movie. Any of the major video-editing software can combine sounds and video clips.